Do you really want to be an emotionless rock? One day, early in the twenty-first century, up on a mountain in the Italian Alps, there were two very large rocks. They sat on the side of a mountain, overlooking a farm on the road between Ronchi and Cortaccia, Strada Provinciale 19 (in case you’re planning a road trip). On that particular day, there were external, contextual factors affecting the rocks, factors over which they had no control. Those contextual factors caused a landslide. And the rocks fell off the mountain. They tumbled down the slope toward the farm. One of the rocks landed on the road and stopped directly in front of the entrance to the farmhouse. The other, similarly enormous rock, however, didn’t stop at the road. It rolled right across it, into the three-hundred-year-old barn on the other side. The force of the impact destroyed the barn, scattering wall planks and whole sections of the roof across the yard. If rocks could feel, how do you think that rock would have felt after it did that? Embarrassed? Guilty? Desperate to blame the landslide? Angry at the other rock for not following through on their plan? Do you think that other rock was obsessing about the carnage it would have caused if it hadn’t stopped? How would you have felt if you were either of those rocks? Have you ever spent an hour thinking about what to write in a text message because you were afraid of saying the wrong thing and ruining a relationship? Have you reread and rewritten work e-mails over and over again, anxious about getting fired or seeming incompetent? Does responsibility make you anxious? Do you spend days obsessing about mistakes in your past? Do you hear people in your head shouting at you for screwing up? Do you spend hours trying to rationalize why you’re not to blame for things going wrong in your life? So here’s my point: Those are all very human experiences. Those rocks in that valley in Italy will never have any of those experiences. I said “If rocks could feel.” They can’t, they’re rocks. 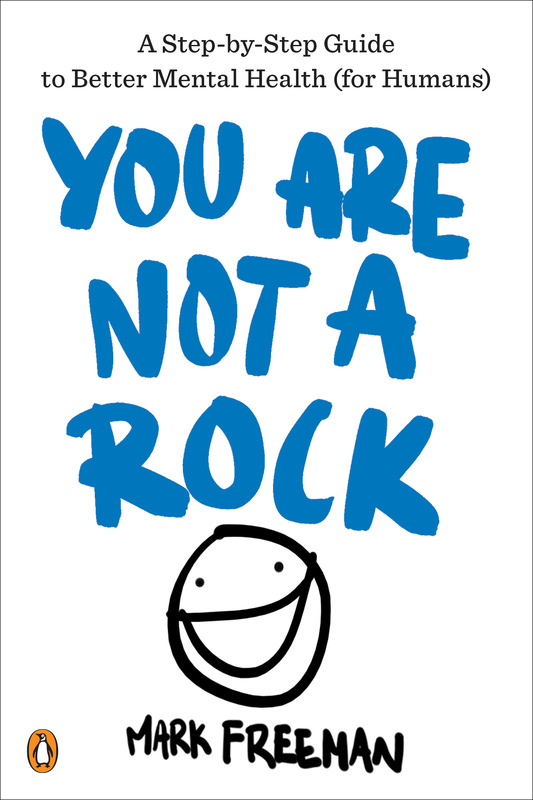 You are not a rock. You feel things. You probably approach physical fitness like a human. If you want to build strength, you lift heavy things that make you feel weak. If you want to increase endurance, you run until you’re sweating and aching and ready to stop, and you keep running a little bit farther so that next time it won’t be so difficult. If you want to be more flexible, you stretch into stiffness again and again until your flexibility increases. You try to go beyond last week’s limits. This paradoxical practice of doing the difficult thing so that the difficult thing isn’t difficult is how humans change. This is a concept most people understand. If you told somebody that you plan to become stronger by avoiding strenuous exercise, even people who don’t exercise would know that’s ridiculous. But there are probably many people around you who encourage you to approach mental health in the exact opposite way. They tell you not to do the difficult things. Avoid anxiety, feel less stress, don’t think bad thoughts, watch out for triggers, get rid of uncertainty, man up, don’t be so emotional, don’t feel bad (everything will be okay). This is not how humans develop abilities to handle difficult challenges. Trying to avoid difficult things makes difficult things more difficult. This is so important to understand as you get started on building better emotional fitness. You can develop your ability to handle emotions by feeling more, especially by feeling more of the feelings that challenge you. By lifting heavy emotions, lifting heavy emotions becomes easier. You can feel a greater range of emotions and you can feel them more deeply. You are not a rock. You feel things. From YOU ARE NOT A ROCK by Mark Freeman, published by Penguin Books, an imprint of Penguin Publishing Group, a division of Penguin Random House, LLC. Copyright © 2018 by Mark Freeman. Mark Freeman is a mental health coach and human centered design workshop facilitator based in Toronto. After recovering from severe mental illness himself, he now focuses on leveraging technology and design to help others navigate the complex changes necessary to improve and maintain great mental health and fitness. He is the co-founder of the online mental health community, EVERYBODY HAS A BRAIN, and he is a Stanford Medicine X ePatient Scholar.